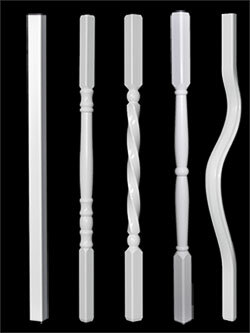 Vinyl Railing Gate Kit Contents: top and bottom rails, side rails, 1 pack of stainless steel screws, balusters (5 balusters for 34 inch wide gate and 7 balusters for 46 inch wide gate) and caps for side rails. 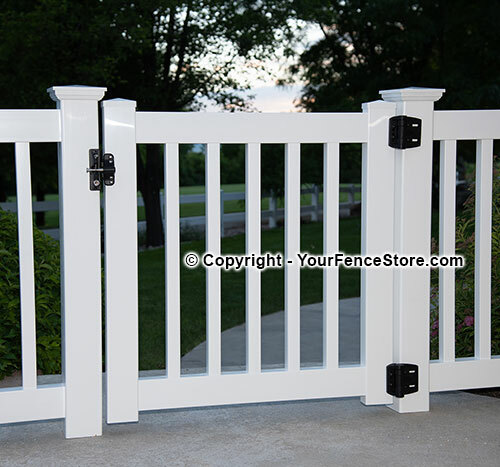 Single Gate Width: our 34" wide railing gate kit will fit a 36" wide opening and a 46" wide railing gate kit will fit a 48" wide opening. The two inch difference allows for a gap between the latch and hinges (if using our Kwik Fit Hinges only subtract 1 1/2 inches). Double Swing Gate Width: to calculate the width for double swing gates, take the measurement from inside to inside of the two posts. Subtract 2 1/2" (if using our Kwik Fit Hinges only subtract 2 inches) and divide that number by two. This should provide the width for each gate. For example, if your opening is 70 1/2" you would subtract 2 1/2" and divide by two. Each gate would be 34" wide. We recommend using the Lokk latch when installing a double swing gate. Custom Gates: Just tell us the dimensions of the gate you want. Don't forget to subtract for the latch and hinge allowance. 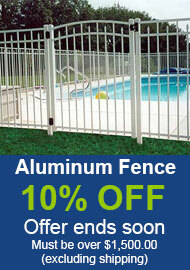 You can also order custom gates online "click here". 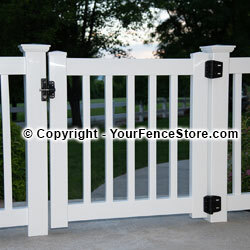 34" Wide Gate: Top and bottom rails can be cut so the gate width is between 29 and 34 inches wide. Gate ships at 34 inches wide. Picture above is shown at 34 inches wide. Once cut the space between the side rails and first picket will be less. 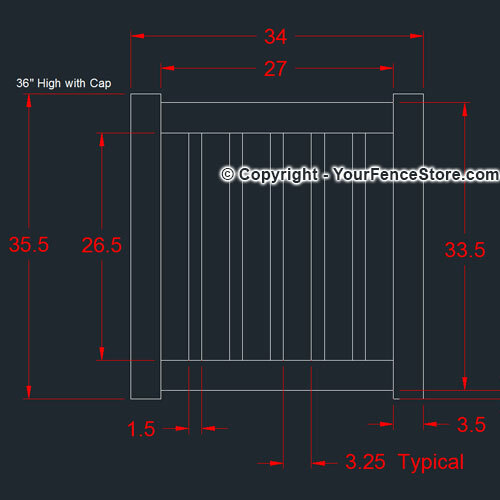 46" Wide Gate: Top and bottom rails can be cut so the gate width is between 41 and 46 inches wide. Gate ships at 46 inches wide. Once cut the space between the side rails and first picket will be less. Free Shipping when ordered with gate hardware. Customer comments: My gate arrived within a reasonable time from my order placement. All the parts I had purchased were in the box and in fine condition. Just looking at the parts, installation was pretty intuitive. I put it together in short order and it looks great - merging seamlessly with the wood deck fencing. I'm very pleased with this purchase.